Uncategories Pocket size has not changed but …..!!! Pocket size has not changed but …..!!! No doubt the dress fashion changes from to time. The reason behind the change is either inconvenience from the style of the dress or the trial of the fashion designers to allure the youngsters by giving the new dress style to the characters in the movie or in the TV serials. Their aim is that the new style should reach people like a revolution and only then there will a real style. The rest is mode and mode passes but style remains. In the past, there had been a tremendous change in the female’s fashion than males. Males are wearing the same old style pent, shirt, and coat with little change in a design suitable to the individual and such maker’s style goes on and on. Fashions come and go but style goes on forever. So far as the pocket style is concerned, except one more friend of mine, none else is having a pocket cap on the front of the pain with button-up but no pocket inside. It has become my style and everyone seeing from the front had raised a question – Dear, is it imported or stitched? Normally, I say, Dear, it is my stitched one in my own style. There is also a ritual of stitching of shroud -‘kafan’ - for the dead body before cremation, without pocket, which indicates that we have come empty handed and has to go empty-handed. 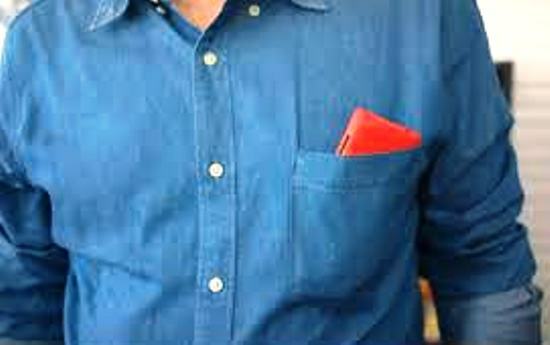 However, with the coming of jeans fashion, a tiny pocket just above the front pocket was added with coin, match pocket and ticket pocket was added to the fashion. Those original copper-riveted jeans had a tiny pocket to hold small pocket watches for working men, from carpenter and miners to railroad engineers. But now we have upgraded a telling tie with smartwatch sand phones and the tiny pocket is usually empty but we love the idea of rethinking it for this generation’s trinkets. From the very beginning, the women fashion don’t have any pocket and now everyone is carrying a technology – mobile – and since the working women don’t carry purses around a pocket is a reasonable thing. Conditions are ripe for a revolution in pockets for women and it is seen in a certain fashion. I recollect when I made a collection of idioms and phrases, - which are universal and hardly any change is required in them – as the same have come out with countless rich experiences of the past. In my one thousand and one collection, starting from – You live only once, if you live right, once is enough – ended with my own created phrase – Contain to Gain, keeping in mind the amount could be put in the old size of the pockets, which has not changed for long years, which means we should give a stop to our demands as the size of the pocket has not changed. Frankly speaking, we live in a developed world and think that we know almost everything. However, it’s a kind of illusion as sometimes we do not even know everything about really common things that are a part of our lives. With the passage of time, the pocket size of men has not changed. It has the same style on the left side of the chest – while very few people like to have pockets on both sides on the chest – and if we equate with the lifestyle with money in your pocket, the problems have increased manifold which cannot be solved with the same size of the pocket.